Canada, here I come! Canadian Book Challenge 4. Learned about this new Challenge from Bibliosue's blog, then followed the link to the initiator of the Challenge over at The Book Mine Set. One year. Thirteen books – one for each Canadian province. Thirteen reads, thirteen reviews. I seldom participate in Challenges, due to lack of time more than anything, but this one resonates with me. I'm far too ignorant of Canadian literature and culture. My theory is the Canadians often get drowned out by the noise coming from their neighbors to the South (shrinking guiltily), and that's why I have trouble naming more than a handful of Canadian writers. Join me next Canada Day – July 1 – and we'll see how much that's changed. 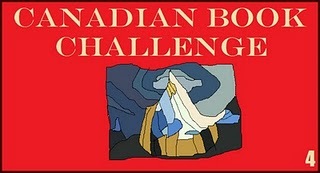 Meanwhile, keep a lookout at my sidebar and you'll see my progress under the "Canadian Book Challenge" header. Previous Post I think my brain may be exploding. Again. Next Post Tentative Canadian reading list.